Leaders’ Debate 2015: turning point in Canadian journalism or predictable dud? The Globe and Mail likely squeezed every bit of coverage from the Leader’s Debate it hosted last week, so let’s discuss why this political event may have long-term impact, or not. 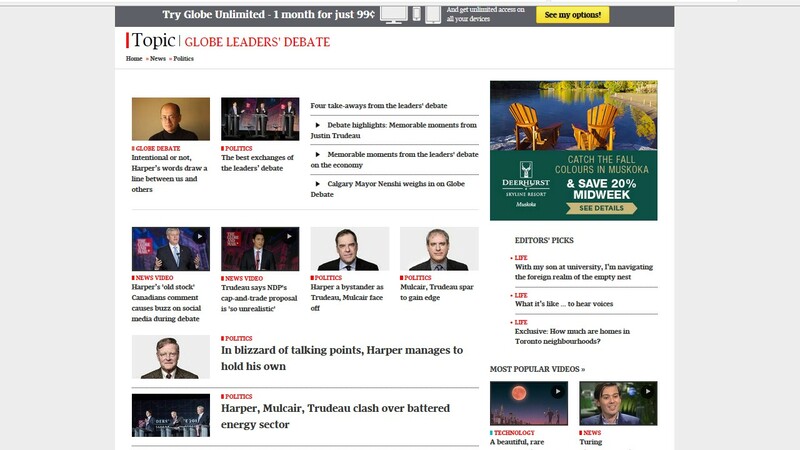 The Globe heroically managed to distill not just Debate Highlights from the 90 minutes show between national party leaders Harper, Mulcair and Trudeau. Editors also treated its audience to Memorable Moments and Best Exchanges. Moreover, the newspaper made available an indispensable series of News Videos to highlight newsworthy items such as Harper’s ‘old stock’ comment (which we were all shocked to learn, no doubt, caused hype on social media). Numerous columns and stories provided further analysis and summaries in print and online. Meantime, on debate night Sept. 17th, CBC The National broadcast a debate about the debate. (Correction: viewers were treated to an analysis by the country’s most-watched national political panel.) Host Peter Mansbridge, presumably in a moment of weakness, couldn’t resist pointing out that an event hosted in Calgary used a backdrop showing parliament buildings halfway across the country in Ottawa. Broadcast amateurs they all are, those folks at the Globe and Mail, right? Rather than news coverage generated or voters’ response, what seems rather revolutionary about the event is this. A stately print publication broadcast one of Canada’s largest national election events. All this while Green Party’s Elizabeth May, excluded from the debate, creatively managed to comment from the sidelines with a series of Tweets. As online news platforms mature, the lines between broadcast and print continue to blur. This Leaders’ Debate demonstrates just how far media outlets have ventured into their competitors’ traditional territories. Will this Globe broadcast come to be seen as a turning point in Canadian journalism when print, broadcast, social media and online news gathering inescapably merged into one joint news stream? The jury may be out if this fluid media landscape will make professional, unbiased political journalism more or less accessible to average Canadians in the long run. In terms of ratings, the new format seems to be a bit of a (predictable) dud. One news outlet reports that 300,000 watched at least part of the political showdown on YouTube. News 1130 further reports that this compares to Maclean’s Debate earlier this summer which gained total viewership of 4.3 million. In contrast, 10.6 million viewers tuned into the 2011 English debate on national TV when in April CBC-TV/Radio-Canada, CTV, Global Television and TVA worked together to orchestrate the political showdown.